Glenda's Papers, Scissors & Rocks: Splat! 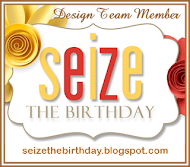 Happy Thursday crafters and welcome to another Seize the Birthday challenge! Hope all is well in your world. It is 100% open at the challenge this week (no topping/option) so hope you can play along with us. I went pretty CAS this week. All the details for playing along is on the blog. We have a new Surprise Party Guest with us for the next couple of months - Kimberly Lackenbach. Be sure to give her, and the rest of the DT, some crafty love. Thanks for stopping by and commenting. Have a terrific day and wonderful weekend. Love this! CAS and so fun! This is a superb CAS card! The splat die is fantastic!!! Splat! I love it! Clean, simple and perfect! Ha ha! When I saw this card...I thought SMAK, it is a great card. Then I see that you titled it Splat! I like that better. LOVE your CAS style Glenda! Have a great week! That's the CAS-est birthday card I've seen, and its still so much fun! That splat sure is at the right spot!